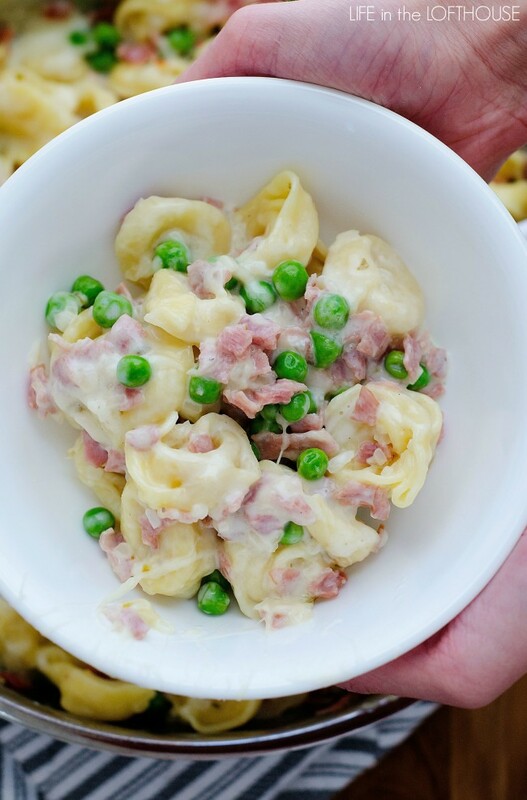 This Ham and Cheese Tortellini will become your family’s new favorite dinner! Well, it’s become ours anyway. This dish is so incredible and comforting. 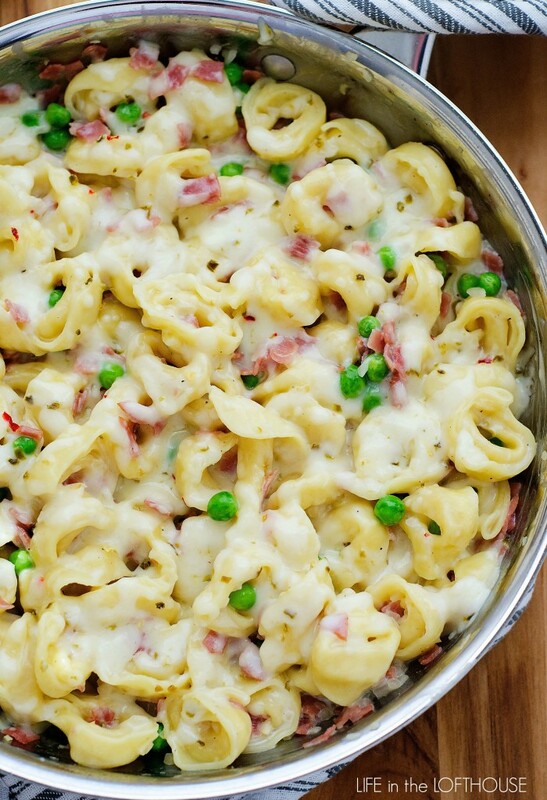 Loaded with ham, peas and cheese-filled tortellini- it is a sure winner for lunch or dinner! When I whipped this up for lunch the other day my kiddos were raving the entire time. Except for Kallen. He was picking his peas out and asking me why I would put them in? LOL Other than that he gobbled his up to. I did use Pepper-Jack cheese in this, and the even though the kids still loved it, they said it was a tiny bit spicy. Next time I make it for them I’ll use Mozzarella or White Cheddar cheese instead. As for Kale and I, the Pepper-Jack was amazing. 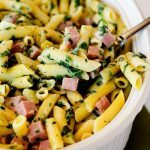 This cheesy ham and tortellini dish will become a family-favorite! Melt butter in a large oven-proof skillet over medium heat. Add diced onion and cook until onion is translucent. Add ham. Cook and stir about 5 minutes. Yumm, simple dinners are the best! This looks amazing: pasta is sooo versatile. This is tasty, versatile and easy!! Great for evenings when you are short on time. Made this for dinner tonight, smells wonderful and looks wonderful too! I made this for family that was in town for the weekend & if I could give it more than a 5 star rating, I WOULD! It was SO DELICIOUS!!!! I might just make it a weekly dinner but add different meats for variety. The sauce was mmm mmm good! 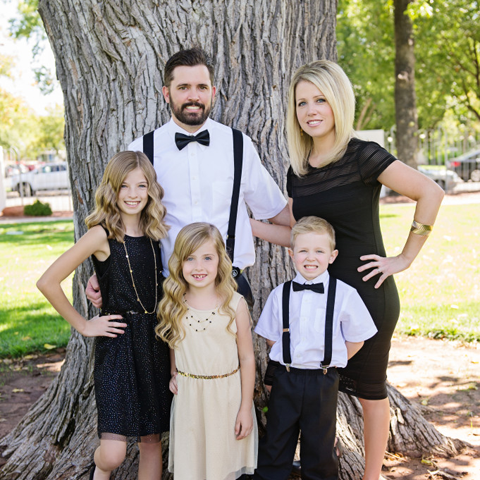 My partner and I absolutely love your blog and find most of your post’s to be just what I’m looking for. Do you offer guest writers to write content to suit your needs? I wouldn’t mind publishing an article or elaborating on a few of the subjects you write regarding here. Nice weblog! 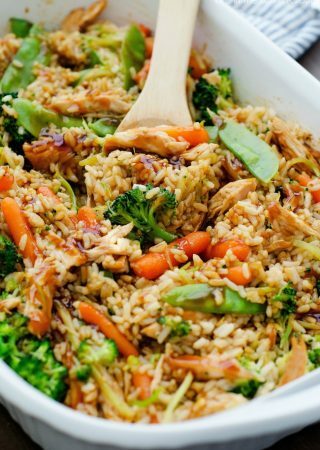 My favorite kind of meal- quick, easy, and delicious! I live overseas and alfredo sauce in a jar isn’t common here so I made with an awesome easy sauce from scratch (http://allrecipes.com/recipe/19402/quick-and-easy-alfredo-sauce/) my whole family loved this from my 1 year old to my 8 year old!! This goes straight to my go-to recipe list. Thanks for sharing! What kind of tortellini do I use? There’s all kinds of different cheese ones. Do you have a link to something from Walmart that I can use with this? I’m planning on making it the 20th when the in laws come in! Could this be a freezer meal? If so, how long would you leave out to thaw and how long to warm it up? I freeze the ham (leftover from Christmas) already diced and have frozen diced onion, so you just start throwing things in the pan. I don’t think you’d want to cook it then freeze it. Your tortellini would be soggy. Do you thaw or cook the tortellini before adding it? Or do you just add it in frozen? Made this tonight quick and easy and very good. My two picky eaters enjoyed it. Thanks for sharing. Very tasty! I love how quick and easy it was to make! Thank you. 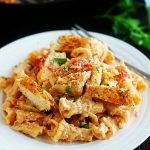 Thank you for sharing a fantastic recipe – quick and easy, but just different enough from the usual that my kids gobbled it up! Fast, easy weeknight meal to use up leftover ham. I doubled the ham, added 1 lb of fresh asparagus cut in 1″ pieces toward the end of the noodles cooking and doubled the peas. It required about 1/4 more broth or water, but turned out well. Thanks for a one pot wonder in less than 20 min. Easily fed 5. 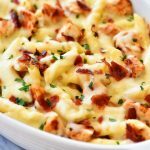 I dont normally comment after making a recipe but this one is so good and easy to make . if you haven’t tried it yet you need to. Followed directions as shown. This is a keeper. Thank you for sharing. This was very good! Quick and easy for a weeknight dinner. We’ll make it again for sure! Just made this. Had to double the sauce because husband likes dishes like this saucy and creamy. Other than that, followed recipe exactly. Ooooooohhhhhh is it good! 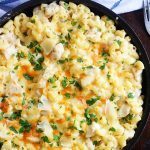 I love that it’s a one pot dish, perfect for a week night! Will definitely make this one again! Made this last night my fiancé and I absolutely loved it! 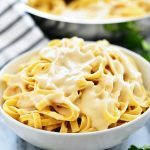 We liked how the sauce wasn’t too rich like an Alfredo but was still creamy and delicious! I love this dish! It is easy to make and my whole family likes it. I am making a double batch next time so that we have leftovers! Just discovered your wonderful recipes. Happy happy happy!! !